A tintype from the Richard Ricca Collection is a portrait of William Noll of the 11th New York Infantry’s Fire Zouaves. He suffered a wound and fell into enemy hands at the First Battle of Bull Run. The editor reflects on the recent Gettysburg show, and notes that he shot five rolls of film during the event. He also promotes an MI slide show, “Mathew Brady’s World: Photography in the Civil War,” and answers a question about the use of derogatory terms for the enemy during times of war. Letters include praise for the magazine, a correction to the recent story, “The Man Who Could Be King” and a request for a feature about army- or depot-issued shirts. Seven publications are mentioned, including Lee’s Miserables: Life in the Army of Northern Virginia from the Wilderness to Appomattox (The University of North Carolina Press) by J. Tracy Power, Letters of a Civil War Nurse: Cornelia Hancock, 1863-1865 (University of Nebraska Press) edited by Henrietta Stratton Jacquette, Civil War Memories: The Collected Writings of William H. Busbey (Eagle Press) edited by Linda Zimmerman and more. A survey of 16 portraits of federal line officers illustrates an essay about the threefold importance of swords to those who carried them in the service of Northern arms. Positively identified men include Capt. Andrew Fagen of the 1st Pennsylvania Artillery, Capt. David Corbin of the 22nd Connecticut Infantry, Lt. Charles Bird of an unknown regiment and Capt. Eugene Miles of the 53rd Massachusetts Infantry. 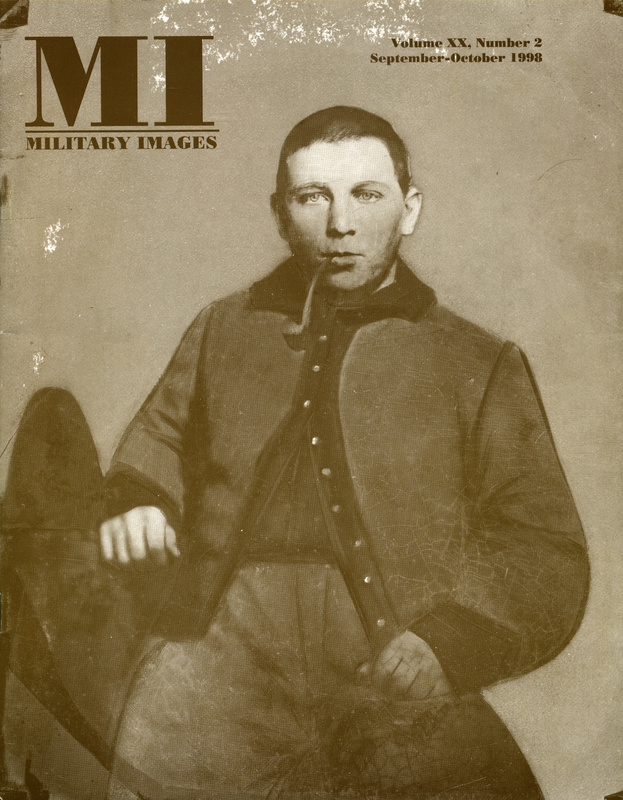 The life and war experience of John O’Brien (1839-1931) is told thanks to a collection of materials that include about 50 letters and a pair of cartes de visite that picture him as an enlisted man and an officer. A survey of 15 images includes eight portraits of cadets in their familiar uniforms with three columns of buttons. Other images picture West Pointers post-graduation. The collection spans the 19th century, though is focused on the Civil War period. This author, who serves as editor of Civil War Serials & Bibliography, connected a letter he had discovered some time ago to a reference in a 1988 story by David M. Sullivan in Military Images. That letter, and another letter written by the author to MI editor Harry Roach, is reproduced here. Also included is a portrait of Confederate soldier John L. Rapier, the writer of the letter. This is a collection of mini-profiles of 16 enlisted men and officers by various authors. Each is illustrated with a wartime portrait. Union subjects include John Davis of the 123rd Ohio Infantry, George Perkins of the 19th Maine Infantry, Nathaniel Perkins of Dow’s 6th Maine Battery, De Van Postley of the 7th New York State Militia and the 174th New York Infantry, Robert Stokes of the U.S. Marine Corps and the 19th and 72nd Pennsylvania Infantries, Frederick Cordes of the 42nd Pennsylvania Infantry, Henry Cordes of the 18th U.S. Infantry, Norvell F. Churchill of the 1st Michigan Cavalry, Joseph Meals of the 15th Pennsylvania Cavalry, William C. Mills of the 21st Illinois Infantry and William Noll of the 11th New York Infantry (cover image). Confederates include Walter Kennedy of the Confederate army and later the 7th U.S. Cavalry, Andrew Lee of the 41st Alabama Infantry, George E. Lavender of Phillips Legion Cavalry (Georgia), John H.L. Bray of the 9th Texas Infantry and Frank Huger of the Virginia Artillery. This unit history, which begins with the regiment’s departure for the Philippines in July 1898 and ends with its return to the U.S. in September 1899, is illustrated with an image of the South Dakotans aboard the vessel Rio de Janeiro at the beginning of their deployment. Reprinted from the January-February 1990 issue of MI, images and text answer the question “When is a monitor not a Monitor? In “The Lafayette Guard,” McAfee explores the history and gray uniforms of the 55th New York Infantry, also known as “The Lafayette Guard” or “The Guard de Lafayette.” The text is illustrated with portraits of the regiment’s colonel, Philipe Regis de Trobriand, and an unidentified private. In this installment, the captain informs his loyal readership that he has temporarily suspended his column because he is at “Uncle Sam’s minimum-security facility at Allenwood, Pennsylvania on a conviction for image tempering.” This does not prevent him, of course, from sharing an image of the father of sculptor Ron Tunison. A sole straggler is an infantryman who probably hails from New York. A sixth-plate ambrotype from the Rick Mack Collection pictures a soldier purportedly from North Carolina.